In the Opladen district of Leverkusen, there is a new quarter that spans across approx. 70 hectares – the new Bahnstadt Opladen (“Opladen station district”). Since 2008, the City of Leverkusen has been developing this new quarter with housing, educational facilities, jobs, shopping, leisure and park land. Platform roofs are also a part of this major project. In mid-2015, Hering received a contract from THG for the construction of two Zwiesel type roofs. The installation of the first roof on the central platform was successfully completed in February this year. It consists of a two-part roof construction, with glazing in the central area of the roof. The roof has a total length of 30 m, is approx. 10.30 m wide, and consists of 5 support axes. 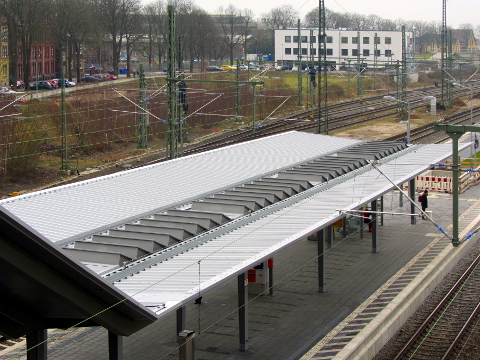 The second roof on the outer platform is scheduled to be built in the second half of 2016.